A piece designed by...the imaginations of first graders! So I guess it was a couple of months ago when I was approached with the request to take on a class project with my daughter’s first grade class. The subject could be whatever I wanted, and the medium was totally up to me…which of course, would be beads. I mean…what else…? In addition to innumerable other items, treasures, luxurious getaways, and standard auction items like that, each class at Forsyth undertakes a “class project”…which is to varying (like…widely varying) degrees contributed to by the students…to be auctioned off at the annual spring school auction. OK. Hmmm. So what could I do, and how could I get the kids actually involved…? 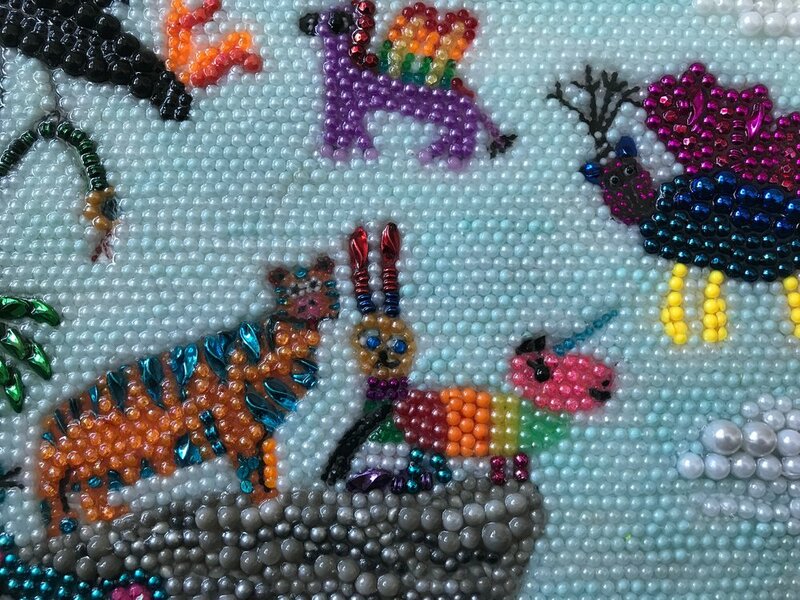 After a bit of pondering, I decided to have each kiddo draw an imaginary creature, however fantastical crazy colorful and wacky they wanted…and I would translate them each into beads and insert them into an imaginary landscape, where they would be frolicking, swimming, flying, or just hanging out. Little did I realize how much color and intricacies their little minds could envision. Most of which had unicorn horns and wings. Of course. And there would be 37 different creatures to create. This would take some time. Like….a ton of time. A lovely couple wanted a rendition of a cork, from the bottle of wine on the day they were engaged, to hang on the wall of their wine cellar. So we decided to make it more of a 3-D piece. The first of such I have ever tried to create. So I cut a little hole in one end piece and squirted in foam filler to fill up the entire piece...which made it nice and solid. I really love seeing where my pieces end up. So of course I had to take part in this little event! And if you are at all familiar with Ashley's ebullient personality and wild sense of humor..or happen to come across her nearly continuous flood of crazy instagram posts ...you'll understand the subject of my valentines. So....I think she liked them. COORS LIGHT Mardi Gras 2016 Advertising Campaign!! So back in mid-summer I got an unexpected call from an advertising agency in Denver. They told me that their client MillerCoors was interested in commissioning me to do a piece for their advertising campaign for Mardi Gras 2016....!!! How unbelievably awesome!! So after a confidentiality agreement and several proposals, we settled on a plan and I got the green light from SAB Miller. A 40 x 40" piece that would be translated into billboards, flyers, and posters in the Southeastern US....during the 2016 Mardi Gras season. Again on a pretty short timeframe (which seems to be a developing trend for me...), it came together beautifully and was shipped off to Denver..
Keep your eyes out for one! Here are a few of my favorite close ups.. Wait! I'm being followed on Instagram by....!!!! Only one of my favorite artists of all time!!! James Michalopoulos. And also the owner of Celebration Distillery...which incidentally makes my favorite Old New Orleans Rum! So how in the world am I going to make mardi gras beads look like ice..? And how do I make it look like there's a little bourbon peeking through under the edges....? I think it turned out pretty icy! So how long does it take...? Honestly as ridiculous as it sounds, I have no idea. After all the years I've been making these things, I've never really clocked any of them. Those of you who know me know how hectic my days can be with everything else join on. 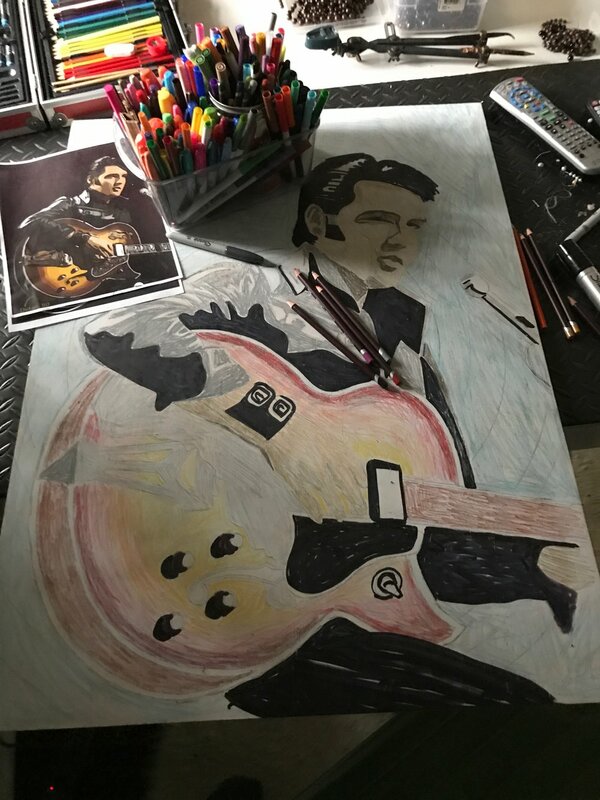 Usually, you know, I work on a piece a little here...a little there...a couple hours one day...an hour or so the next...until whoa! it's done. So when I sat down to start working on Humphrey and Marilyn (under a pretty tight timeframe I might note), it dawned on me that it would be kind of fun...and maybe a little enlightening....to keep track of just exactly how long they took me to finish. So there you go. That's how long. the spoils of mardi gras! Thanks to Mara and Amy and their girls, about 170 lbs of these shiny plastic things followed me home this time.. This should keep me in business for some time. Who needs FedEx when you've got a seat on Southwest and a couple extra duffle bags? I think the first ones were for my little girl Marie and her almost-twin and best friend Biz for their 3rd birthdays. happy 80th birthday to the KING! yes it's true. The King of Rock and Roll would have been 80 years old today. A little mid-project modification for Bazaarvoice..
Basically, a big version of their logo in beads. No prob. Pretty quick deadline...no prob. But in the end I think it turned out pretty damn righteous. Lucite-coated for extra sparkle!